We are a prominent Manufacturer, Supplier and Exporter of Salt Bath Furnace Transformer from Mumbai, Maharashtra. Our Salt Bath Furnace Transformer finds various applications in different industries, mainly for the purpose of heating. The pre installed transformer can provide quite a high range and can maintain heavy resistance loads with ease. Because of this, our Salt Bath Furnace Transformer is widely demanded all over the world. 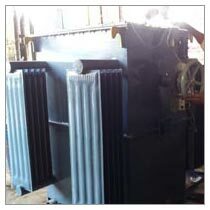 Customers can avail of Salt Bath Furnace Transformer from us at reasonable rates.